This final installment on the top command will discuss the alternate displays for top. 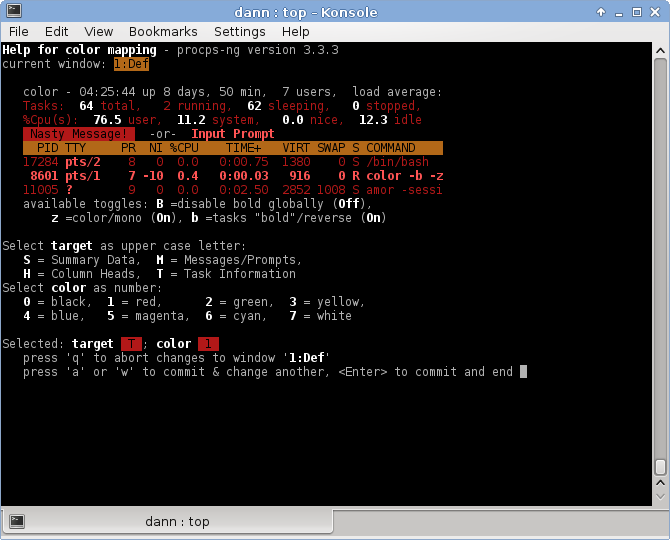 When starting top with the defaults one is presented with a full screen view of top containing the summary window at the top and the task area in the bottom. The task area usually takes up three quarters of the top window. This display is not the only informative view that top has. By pressing the “A” (<shift>+<a>) key the “Alternate Display” view is presented where the task area becomes four separate task areas of equal size called “field groups”. The summary area remains where it is. Each of the four field groups displays the task information in a different manner. At first the summary area may not appear to be different. But do note that each task windows has a corresponding summary area associated with it. When focusing on a different field group the corresponding summary area will be displayed. Any changes you make to the display of a summary area for one task window will not be carried over to the other task windows. Each summary area remains independent of the other summary areas assigned to their corresponding field group. The example above, the right window shot shows “1: Def” as opposed to top in the overlapped window to the left. Moving between field groups is accomplishsed using the “a” key to move down the field group list (forward) and the “w” key to move up the field group list (backward). Wrap around is applied so if you press “a” on the last field group it will wrap around to the first and pressing “w” on the first will wrap around to the last. As you move through the field groups the name of the field group will appear in the top left corner of the summary area and the summary area will change accordingly to reflect the field group you are on. If you are not sure how a field group is sorted recall the use of the “x” key to highlight the sort field. Again, the default name for each field group will list the sort field. 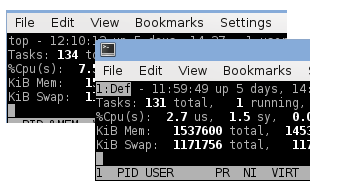 Note though that the first field group displays “Def” short for “Default” and is sorting on the defined default fields, which if unaltered, is “%CPU”. Pressing the “g” key will prompt for a field group (1-4) to focus on. This navigation technique can be used instead of toggling through the groups using the “a” and “w” keys. This command, though, is more useful in full screen mode where you can change between field groups that way. The four different field groups already exist in full screen mode even though the “A” key was never pressed. Top allows you to view system information in different ways in different field groups without having the constantly toggle sort fields, turn fields on and off, and other options. Again, when in full screen mode you can move between field groups using the “g” key and choosing which field group you want. Pressing the “a” and “w” keys in full screen mode will not navigate between field groups. When in the alternate display mode you can hide/show field groups by pressing the “-” key. This will hide the current field group but take note that you will still be focused on that field group. If you press “a” or “w” to move to a different field group the group that you have hidden will remain hidden until you navigate back to that field group and press the “-“. Hidden field groups will still take navigation focus but not display. You can note this by the field group name in the upper left corner of the summary area. You can toggle between “hidden” and “visible” field group mode with the “_” (<shift>+<->) key. 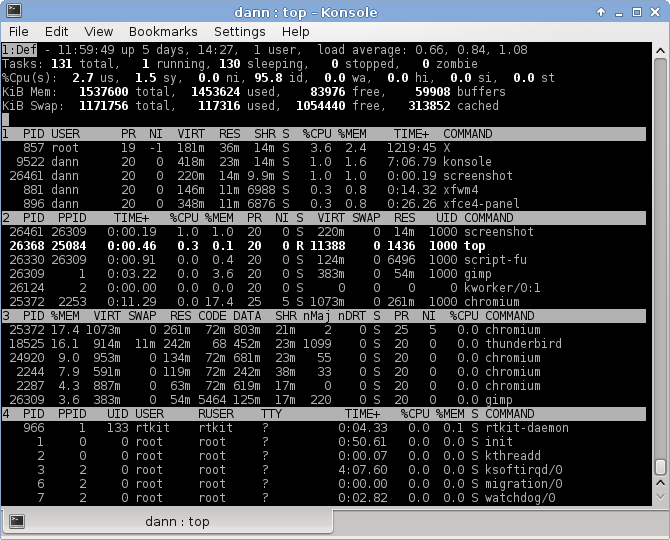 What this accomplishes is that the top window will switch to displaying any hidden field groups. Pressing “_” again will return you to the “visible” field groups. In either mode “-” will toggle a field group between hidden and visible. So if you are in the hidden field group display and you press “-” the field group will disappear from the hidden display and turn on again in the visible display. When you press “_” again to move to the list of visible field groups you will see the field group you made visible again. In either mode you can toggle a field groups visibibility with the “-” key. The field group name can be changed using the “G” (<shift>+<g>) key. You will be prompted to enter a 3 character name for the field group. The final control keys for field groups are the “+” and “=” keys. As in full screen mode, the “=” will return the current field group to the top of the sort list, reverts any “idle tasks, max tasks, and user filters.” The “+” will do this for all field groups. To change colors select the corresponding target and then the color number from the color list. A preview of your selection will be shown at the top of this window. You can cycle through the field groups by pressing the “a” and “w” keys. Press the <enter> key to quit and commit your changes. Top has a “bold” options which will bold certain fields of import including sort fields, messages, and changes. Bold is turned on and off with the “B” (<shift>+<b>) key. If you configure top to your liking and want to keep the settings, you can write the current configuration out to a .toprc file by pressing the “W” (<shift>+<w>) key. This concludes our exploration of top. I do hope you just on a holiday or something and havent stoped your Linux Tutorials. Im trying to learn bash scripting and your epsoides have been invaluble.